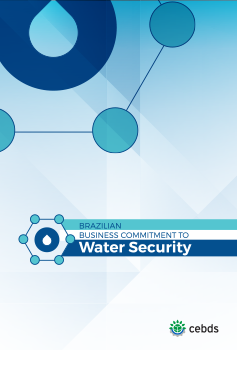 Understanding the urgency to address the critical situation of the Brazilian water security, we launched, under the leadership of the Brazilian Business Council for Sustainable Development (CEBDS), the Brazilian Business Commitment for Water Security, which, in addition to consolidating the effective contribution of Brazilian business sector to the country, will enable Brazil to emerge in the major agendas about global water, as a key actor in the implementation of innovative solutions, taking this legacy to the next World Water Forum in Senegal in 2021. We work to our Commitment becomes a national reference of an effective contribution of the companies to the water security in the country. This will bring transparency and visibility to data and information about actions, projects, goals and commitments assumed individually and collectively by the signatory companies, allowing greater engagement and diffusion of experiences, learning and information among the Brazilian business sector.